Since 1936 the artistic must undergo censorship. So it was for several years until in 1957 the censorship was exercised by Dirección General de Radiodifusión y Televisión, Ministerio de Información y Turismo, in which a single person described how makes or not makes songs unless you left proof of their reasons in writing. In 1966 the Orden Ministerial del 6 de octubre (BOE nº 256, del 26-10), about the authorization of sound records, establishes the division of powers between two Direcciones Generales to allow the contents of the phonograph: Dirección General de Información for visa and authorization of content to be recorded and the Dirección General de Radiodifusión y Television allowed his public broadcasting. In 1970 , turns to do this same distinction in another law going to be exercised the powers of the Dirección General de Información by The Dirección General de Cultura Popular y Espectáculos. Nevertheless, and in spite of that standard and clearly established it in 1966, until 1970 censorship not was exercised in this Dirección General, unlike the Dirección General de Radiodifusión y Televisión, which already was exercising powers conferred in 1966 from long ago. It was in 1970 when you create the administrative apparatus within the Dirección General de Cultura Popular y Espectáculos to exercise its powers and is from that moment when they begin to reflect in writing the refusals of authorization for the recording and publication of the discs, as well as the reasons in a lot of cases. The main motivation of this regime is that from the mid-1960s music not reaching already just through the radio people, but that with some improvement in the standard of living began to consume devices players and discs that people could listen at home. Therefore, from 1970 and applying regulations already in force from four years ago, four people that it came from the censorship of the Dirección General del Libro and they offered you that money extra to do their job with discs in the afternoon. These censors never had a normative code at your service and they never told with some instructions, so in his work were guided only by your own judgment. In this way, the censorship was totally arbitrary and there was a total lack of coherence in the treatment he underwent records censored by different 'readers' disks. Anyway, records from the General Administration archive in Alcalá de Henares is could be summed up all the casuistry found in four thematic, following classifications made by different authors in other cultural areas: moral, religious, political and social. The censure procedure followed since its inception a processing administrative, bureaucratic, even, which was perfectly adjusted. Companies remitted the disks with the texts of the songs intending to edit or burn and folders that sought to take their product. That instance formalized by the Phonographic company representative was home to a record that included the relationship of texts for those requesting authorization, its authors and the musical genre on its back. Then the censors of Dirección de Cultura Popular issued their report and that was almost always contain the number of instance, song data, texts that are intended to record (translated, if applicable) and, finally, qualification or resolution, as well as observations deemed relevant. Previously they gave transfer to the Direeción General de Radiodifusión y Television so that it deems if the submitted songs could radiate. Thus, there could be the case that the first would allow the release of an album while the second banned its radiation, which meant virtually its commercial suicide. This resolution was sent to labels and, if it was negative, was the possibility of resolution of the Dirección General. There he again studied the text and was issued a second resolution signed by the Deputy Minister. If new denial, only could be the possibility of contentious-administrative appeal within the period of two months before the corresponding Division of the Supreme Court, but only starting from 1967. Radio also had their own lists censorship. 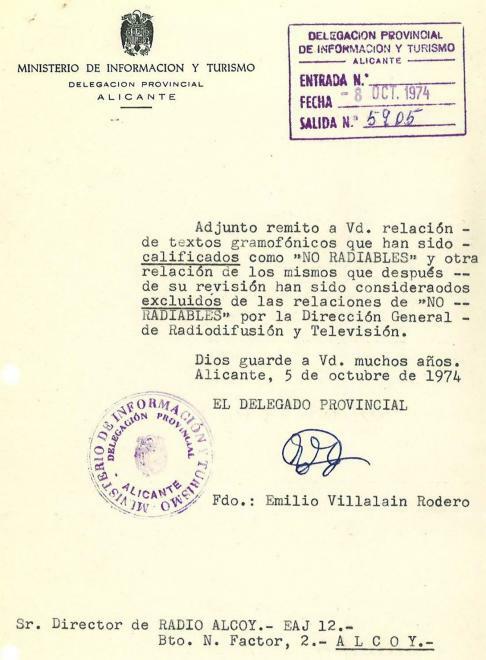 With the denomination of “Textos gramofónicos calificados como “no radiables” by the Dirección General de Radiodifusión y Televisión” they were banned for their radiation public, from the 16 September 1960 until October 9, 1977, 4.343 songs in Spain. 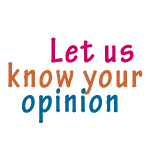 During that time, censorship in the General direction of broadcasting and Television was evolving according to the Ministers who were in charge, the subject matter of the submitted songs, the new concerns of society expressed through its artists, etc. The lists were produced initially from the copies of the recorded discs sent to the Directorate-General in fulfilment of the 4th of the Circular of June 6, 1960, and sent to all the record companies, which forced to deliver two copies of the albums released for the purpose of verification and visa. 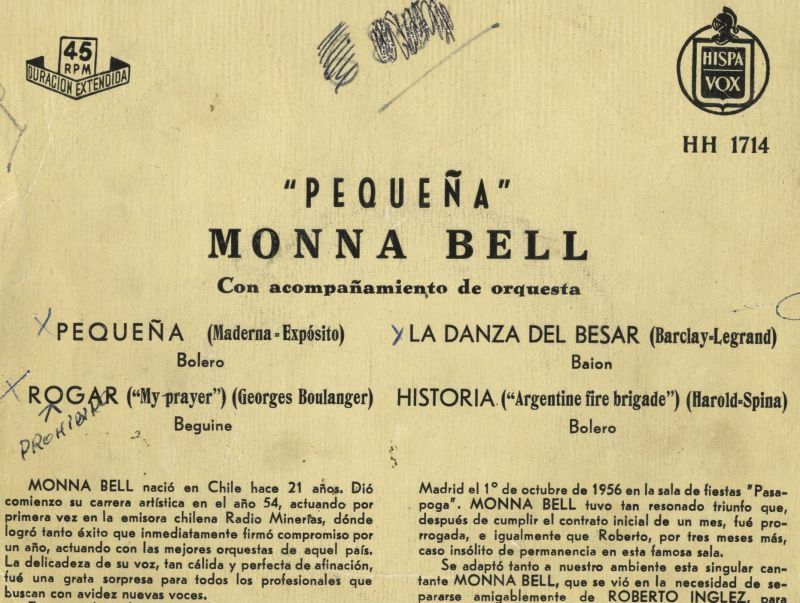 (Details from the back cover and label of the singer Monna Bell vinyl single, "Pequeña ; Rogar ; La danza del besar ; Historia" edited by Hispavox in 1959? with the annotation: forbidden. The disk belongs to the collection of vinyl from Radio Alicante Cadena SER of the library of the University of Alicante). Once checked the discs, the lists were sent to all radio stations in the country. Already in the radio stations, the form which had each one to avoid the dissemination of those discs were of diverse nature, especially on Radio Nacional de España: from writing up the disk cover and on the inside label the words 'no-form' or 'forbidden' up to scratch the vinyl with a punch, making it virtually useless, or, also, hitting over tape. These lists constitute a unique source to try to understand the criteria for censorship. 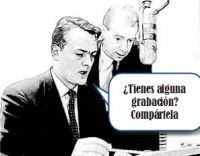 Although it is not possible to know nothing of the justifications of the censorship that was carried out in the Dirección General de Radiodifusión y Televisión, yes were recorded were those songs that might not be radiated. The importance of these lists is that censorship of the texts is only verifiable from 1970, with the creation of the Negociado de Lectorado, Dirección General de Cultura Popular y Espectáculos. Therefore, since 1960, date in which confirmed the referral lists of radio stations, until 1970, in which there are already the first parts of the censors of the Department for assistantship of the General direction of Popular culture and entertainment, the only source for censored songs are those lists, though, as has been saiddo not include any explanation on the causes of its ban. Those 98 relations be added, starting from September 20, 1966, 42 listings that also reach the 9 October 1976 and under the name of “Relación de textos gramofónicos que habiendo sido objeto de revisión, deben considerarse excluidos de las respectivas relaciones de ‘no radiables’”, they include 564 songs which, after be reconsidered by the Dirección General de Radiodifusión y Television censors, are definitely pardoned and may be radiated from the moment in which they appear in the corresponding lists.